Former enemies must find a way to survive the apocalypse together. Even with an uneasy truce with the Nation, tension mounts inside Broke Jaw Ranch. The militia is dismantled, resources are scarce and the Dead are encroaching. Across what used to be the U.S.-Mexico Border, Daniel is in charge of securing the world’s most precious resource and Strand grapples with how far he has fallen. Madison (Kim Dickens) has reconnected with Travis (Cliff Curtis), her apocalyptic partner, but Alicia (Alycia Debnam-Carey) has been fractured by her murder of Andres. Mere miles from his mother, Nick’s (Frank Dillane) first action as a leader saw Luciana (Danay Garcia) ambushed by an American militia group — the couple escaped death, but Nick no longer feels immortal. Recovering both emotionally and physically, Strand (Colman Domingo) has his sights set on harnessing the new world’s currency, and Ofelia’s (Mercedes Mason) captivity will test her ability to survive and see if she can muster the savagery of her father. 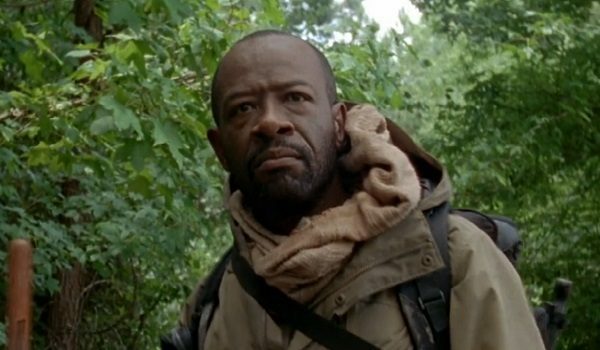 Hopefully Morgan will be making fleeting appearances in TWD – great character!